Sergio Fonseca kept us up to date with the way practice and qualifying for last weekend’s event developed: now, after a slight delay, we can bring the story of the race. 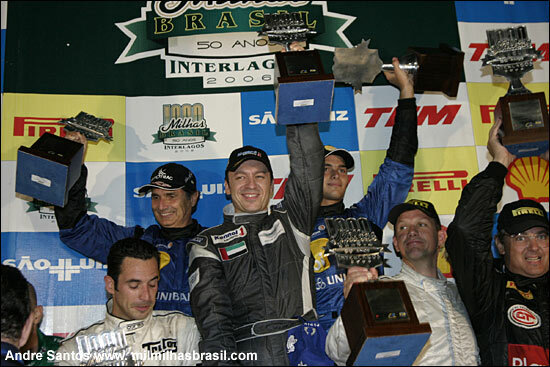 In simple terms, the Cirtek Motorsport Aston Martin DBR9 driven by Nelson Piquet, Hélio Castro Neves, Nelsinho Piquet and Christophe Bouchut won the event, with a five lap margin over the Capuava Mercedes – which was a remarkable turnaround for the blue Aston Martin of Rob Schirle’s team, after a fraught build-up to the race. “At Christmas, we’d decided we couldn’t do the race,” explains Rob Schirle. “We were short on funding – but Antonio (Herrman, the race promoter) helped out, and persuaded us to go. The Aston Martin did arrive in time, on the Monday of race week, but by the Tuesday, only half of the team’s equipment had turned up – and the missing boxes included one containing the race engine. The missing kit was still in London, so having taken out the ‘tired’ FIA GT engine, the poor mechanics had to put it straight back in. After all those dramas, Cirtek’s race was “perfect. We carried out perfect pit stops, made the right call on tyres towards the end – and it was the fastest Mil Milhas on record,” said the proud, winning, team owner. The race had started without two cars. 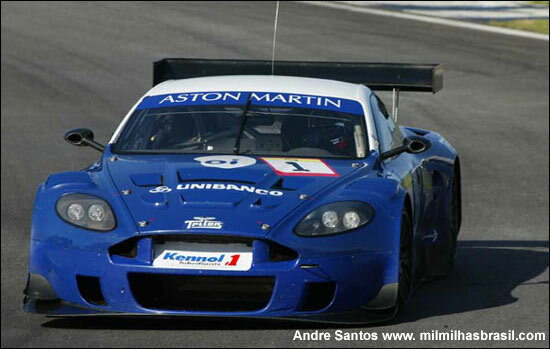 The Alcides Diniz Aston Martin DBR9 didn’t have a replacement engine, having lost a V12 in qualifying, while the Mitsubishi Stock Car wasn't a runner throughout the week. The eternal pole position car, the ZF01 Chevrolet, took the lead from the start, from the GLPK Corvette C5-R and the Cirtek Aston Martin DBR9. The battle for the lead in the early going was between these three. It was an unfortunate beginning for the GPC Squadra Corse Ferrari 575 GTC of the Marques family, this entry suffering a puncture and suspension damage. 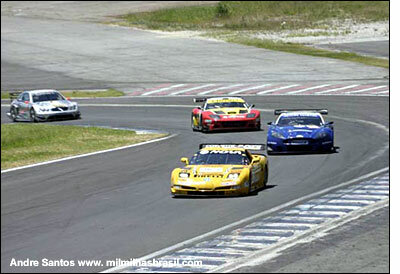 After 57 laps, the Chevrolet engine in the ZF01 blew up and Paulo Bonifácio, Felipe Giaffone and Vítor Meira were out of the race – leaving it to the GT1s. Paulo Bonifacio had high hopes of a win this year, as his prototype will be barred in 2007. So the Piquet Sport / Cirtek Motorsport joint venture assumed a position at the top of the classification followed closely by the yellow Corvette. 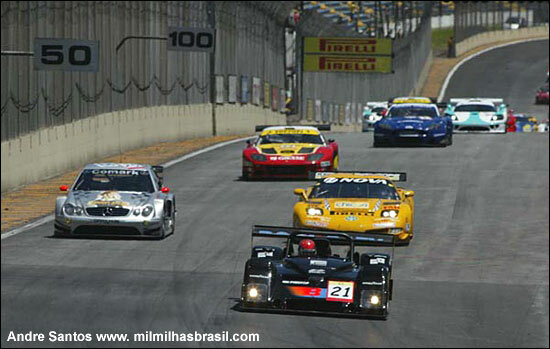 Capuava Racing Team’s Mercedes CLK DTM was just behind, looking strong at this stage. Towards the end, the Corvette C5-R was struggling with engine trouble, and came home seventh, behind Franz Konrad’s #4 saleen, this one suffering broken suspension that cost around 15 laps. Franz Konrad: "I was going up the hill, flat in fifth gear, and before the 50 m braking point, the car turned to the left, towards the wall. It was (could have been) very bad." Without the ZF01 and the Corvette, the Cirtek Motorsport Aston Martin DBR9 had an untroubled end to the race, the rain not disturbing the car’s form. With the Piquet family on the top of the podium the race enjoyed tremendous media exposure, and Antonio Herrman couldn't have been happier. "This was an excellent opportunity to drive with my son,” said the former F1 Champion. “That was the reason why I came to the race and the victory with him was sensational. Marvellous! First is first and second is the first loser," was his rather blunt reaction. “Nelson drove one stint, and matched the other cars on the track,” commented Rob Schirle. “He’s still got it, even though his last race was at Le Mans in one of the McLarens. It was such a pleasure to work with four professionals – to have drivers of that calibre was awesome. 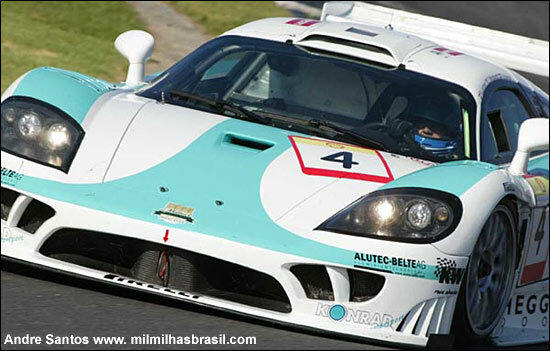 And Cirtek Motorsport not only won the last race of 2005, but also the first one in 2006. "Despite everything, by the start of race, I came in for my first pit stop in the lead, which wasn't bad at all,” commented Christophe Bouchut. “We were quite confident, but nevertheless, for a ten hour race, your car has to be incredibly reliable, and the Aston, despite everything, is still a relatively young car. My co-drivers were also relatively inexperienced in the car, so there were a number of factors counting against us. We really put in a faultless performance, all of us: the drivers, the mechanics, everyone. I will really retain some fantastic memories of this race. Another first for my collection, along with Le Mans, Spa, Daytona - which is quite inexplicable." Alcides Diniz’ Mercedes CLK DTM is not an endurance car and couldn't go head-to-head with the big Aston Martin, but Tony Kanaan, Pedro Lamy, Giuliano Losacco and Raul Boesel were happy to finish in second. "It was a big pleasure to race in front of my people,” said Kanaan. “Struggling with health problems, Alcides Diniz did an excellent job and gave us a fabulous car to drive. It was more difficult than IRL races as the competitor level was extremely high. We didn’t have a chance to fight for the victory." The last podium position went to Konrad Motorsport’s #5 S7-R. Didier Theys and Jean-Marc Gounon were just what Antonio Herrman needed to secure third place. "I enjoyed the race very much,” said Herrman, “but I think the best thing for me is that Nelson and Helio were on the top step of the podium - much better than me! This is the first time ever that I've lost a race and been happy about it! But I still have a good prize." Franz Konrad's team showed a very welcome return to form. 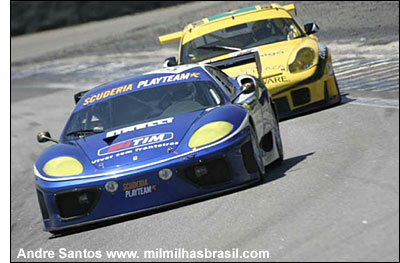 Playteam SRL’s Ferrari 360 GTC drive by Giambasttista Giannoccaro, Alessandro Pierguidi and Toni Vilander were the GT2 winners. The Spanish GT Champions were always on top of the class and finished in a solid fourth. Baluarte Racing Team’s Porsche 911 GT3-RS line-up pushed hard but the former PK Sport car couldn't beat the Italian rival. Antonio Herrman and his organising team were very happy with the show and are already looking forward for 2007 edition - the first round of the 2007 FIA GT Championship.